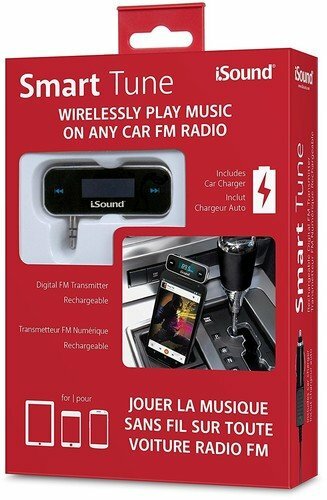 Take your music on the road with the Smart Tune FM Transmitter from iSound. The high fidelity sound transfer and stable transmission in different environments ensure an enjoyable music experience while traveling. This device transmits audio wirelessly up to 30 feet. The Smart Tune features a built-in rechargeable battery and comes complete with a car charger to recharge your transmitter on the go. Even use it for hands-free phone calls through your sound system for enhanced safety while driving. The Smart Tune is compatible with most smartphones, MP3 players and tablets that feature a 3.5mm audio port. LCD displays frequency with backlight. Includes touch key design and high fidelity stereo with full frequency range and memory for last frequency. High fidelity stereo with full frequency range of 100Hz to 15,000Hz for full bodied wireless sound reproduction. Can also be used for phone calls through the vehicle sound system. Bright LCD displays FM frequency with backlight for low light viewing. Includes soft touch key design and holds last frequency in memory even when powered off. Transmits to FM radio frequencies from 87.5MHz to 108.0MHz with PLL to ensure clearest reception even in large cities with many active radio stations.